S.P. Publishing Group Co., Ltd. Message from the Tourism Authority of Thailand on the occasion of S.P. Publishing 10th anniversary. We all know that Chiang Mai is the city that travelers both Thai and foreign value highly for its charm, extraordinary sites, and people. Also, the reputation for craftsmanship has made Chiang Mai become the center for exports in the North of Thailand. These are the reasons that visitors are impelled to come here again and again. Therefore, information is always the priority for tourists. Publicizing and updating all events needs a professional helper of which S.P. Publishing Group Co., Ltd. is a fine example�one of our best promoters of tourist events and services for many years. On the first of every month, we always receive stacks of Guidelines and Chiang Mai Tourist Guides. Then a week before the end of the month, we get another pile of COMPASS magazines. It provides information about the entrepreneurs that are trying to realise TAT�s plan to promote Chiang Mai. On the 10th Anniversary of S.P. Publishing Group Co., Ltd., we wish you success in growing and continuing to enlarge the Chiang Mai economy and helping the community. The primary objective of this magazine is to assist you - whether you�re a new-comer or an old hand - to enjoy and get as much benefit out of your stay in and around the Northern capital as possible. That�s why we�re providing you here with a brief description of Thai customs and religious practices, as well as offering accurate information and advertising about the shopping facilities, restaurants, hotels and crafts for which the North is famous. You will also find information about sightseeing, trekking and historical sites, while we try to keep you abreast with the many festivals and other events that month by month make life in Chiang Mai so attractive. We hope this magazine proves as helpful as we intend it to be. So enjoy yourself here, and if you have any suggestions about improving this magazine, do write and let us know. Chiang Mai ('New City'), the Northern Capital of Thailand (often referred to as the 'Rose of the North'), was founded by King Mengrai at 4 a.m. on the 14th April 1296. Sited approximately 700 kms. north of Bangkok on the Ping River in the fertile Chiang Mai valley, it is some 310 metres (1,027 feet) above sea level, which accounts for its slightly drier and cooler climate than most other parts of this country. The population is estimated to be 250,000 persons. The province itself is large, measuring 130 kms from east to west, and 320 kms from north to south. As well as Thai nationals, it is the home of various colourful minorities, many with Thai citizenship, including the Lua, Mon, Karen, Lisu, Akha, Hmong and Muser peoples. To the west of Chiang Mai is Myanmar (Burma), while the provinces adjacent are Mae Hong Son, Chiang Rai, Phayao, Lampang and Lamphun. 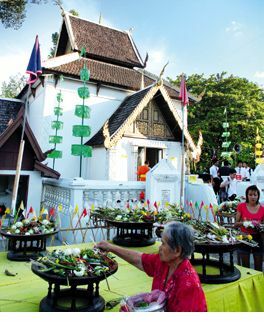 Like its culture, Chiang Mai�s architecture reflects Lanna Thai, Burmese, Sri Lankan and Mon influences. There are some 300 temples in the city and on its outskirts. The Golden Age of Lanna-Chiang Mai lies some 500 years back in the time of King Tilokarat, but the city has recently been undergoing a process of regeneration, and while full of the bustle of modern life, it hasn�t lost touch with its glorious past. Chiang Mai will fascinate you, you can be sure of that. And its people will welcome you with their traditional charm and hospitality. Enjoy your stay!